Ethiopia is one of the few countries in the globe which have a long and continuous central government. Ethiopia has existed as a political entity since the 1st century BC, long before some powerful nations like America existed. It had a strong and influential empire (Axumite Empire) along side the world’s powerful empire of the Outman and Rome empires. Furthermore, it is the only country in Africa which strongly resisted and defeated colonial powers. However, the process to build democracy is slow and sometimes frustrating. Unlike, our African brothers, like Kenyan, we experienced very brutal government and decades of civil war. Consequently, we have never had a strong opposition parties in our history. During the last few years of Haile Selassie’s regime, there was a wide spread student movement asking for change, under the slogan of “Land to the tenant”. Nevertheless, the movement was scattered and lack organizational structure. Hence, the army filled the vacuum and deposed the regime and established the cruelest government in history of mankind. This was happened because there was no strong political party which could organize and led the civil unrest into its objective. 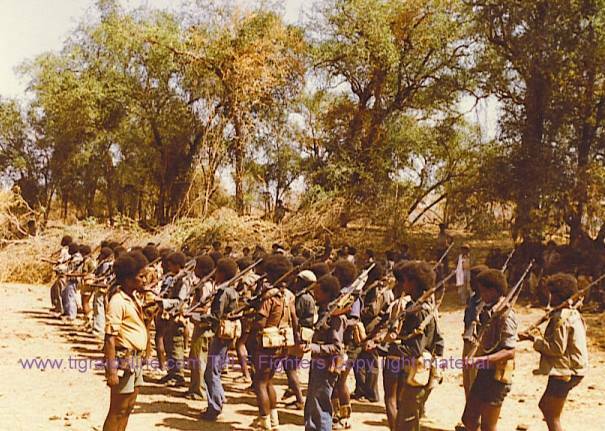 It was during those days EPRP got a support of Ethiopian student and intellectuals. Shortly, after Derg sized power, EPRP rocked with internal and external crises. Some of them abandoned the party and joined the fascist regime to crack down their previous comrades. As some remnant of the party said the personal disagreement between the Hailu Fida’s and some executive of EPRP contributed to the failed attempt of opposition parties to challenge the government. In 1991 with the fall of the Derg, we hit the road with great hope and expectations to our country. The new government, EPRDF, made some admirable move in following a democratic multiparty system, establishing a free press, and on top of all respect rights of nation and nationalities. However, 16 years after starting the journey, we are still struggling to establish institutions which can support the democratic process. Still opposition parties in Ethiopia are so weak to challenge the government. Some believe that the weakness is attributed to well-crafted policies and deceptive diplomatic efforts of the current government. I definitely, do not share this idea for the mere fact that the opposition parties are weak because the hidden motive of their leaders. Obviously, political parties seek to attain political power. But, power is not the ultimate goal as it is a means to serve the society and its interest. Unluckily, Ethiopia has not yet seen opposition leaders who want to scarify their personal prestige for public interest. In this days it is very common, to see opposition parties running for election during election time and ban themselves when there is no election. Meanwhile, it was a few months before the May 2005 general election, we heard some political parties were merged and formed CUD, or commonly known as Kinijit, to run for seats in both the national and regional government councils. Some of us in Diaspora were hopeful to see the long waited strong opposition in our country. I knew some of my distinguished professors, like Dr. Befukadu Degife and Dr. Hailu Araya, were leading members of the coalition. I said to myself and my friends this is the birth of strong opposition in Ethiopia. Nonetheless, some expressed their doubt whether the ‘Kinijit’ would work or not. Their concern emphasized on, first, CUD was formed hastily to run for the election. Second, the parties, even individually in the unity have diametrically different stand. We latter knew that some of them have a hard line stand which wants to get the government rid forcefully and some of them are liberals. Last but not least, most of them are a well qualified academician; they did not have political experience to cope with a very complex Ethiopia political arena in particular and the world at large. Unfortunately, like EPRP, CUD also failed to deliver what it promised to the public and rocked with internal crises. As it is a very recent memory, most of us knew what happened in that general election. The parties, CUD and UEDF complain there was voting irregularities in the process. The international observers gave a mixed observation results. We knew what the AU and Carter center on one hand, and the European Union on the, other hand, gave their impression on the process. I did not want to talk the alleged voting irregularities in this small article as it was very controversial and needs more space to talk about it. However, it should not have bee an excuse for the leaders of CUD to put themselves aside from the political process. They needed to be part of the political process, worked hard, scarified for the sake of the people. Voting irregularities is not unique for Ethiopia. Even in most democratic county in the world, USA, we knew what had happed in 2000 and 2004 elections Mr. Bush visa vise Mr. Gore and Senator Kerry. Knowing what we have seen on the ground now, the move took by Mr. Lidetu, the leader of Medihin Party, was a wise action. Some Diaspora extremist condemned Mr. Lideti for his action as betrayer and now there are tempting to label their favorite leaders as betrayers. If that is so, Mr. Lidetu deserves appreciation because he proved that he is a far sighted leader unlike the academicians. Aftermaths of the election were terrible and people were died, material like public transport was destroyed and some people were targeted because they belong to that or this group. Why was this happened? People are incited to protest the result. The so call demonstration continued especially in the capital. As we all know demonstrations are organized by political parties or individuals. Moreover, demonstrations are usually held around government institution. For instance, in USA, we usually see demonstrations around Capitol or White house so that to send their message to officials. Protestors have, also, obeyed to the rule of the land and it must be peaceful as much as possible. Hence, from this point of view, the so called protest held in Ethiopia after the election had some problems. First, as the CUD leaders then said to the public they did not organized the protest. Second, the demonstration was not held around the national Palace, Abuyet Square or some major streets. It was mainly concentrated around Markato area. Why? I leave this for readers. Last, by any measurement it was not peaceful, destroys materials and tried to incite ethnic violence. Therefore, it was really a mob. Did the government have the right to control the mob? Definitely, yes, as the consequence would be sever if the mob was not controlled. Did the government take excessive measure? I do not know. It may or may not. It may be helpful to see what is happening in Kenya currently. People, including children have burned to death because they belong to this or that group as politicians failed to compromise their difference. Kenya once praised for its western style democracy has been rocked in political crises since the recent election. This would definitely showed us democracy must be home grown it would not be imported from the west. Hence, our politicians need to be patient and smart to see Ethiopian democratic process growing. As some analyst said the current crises in CUD started back immediately after the election when some wanted to join the process and some opposed it. Knowing what we now know it was a mistake to unite for election purpose only when there was no common ground or understanding on major issues. Even, the separation was as bad as the merge. Now CUD is not one but many, with the major group, the pro Dr. Birhanu and the Hailu Shawol’s group. They accused each other as dictator, inefficient and power monger. The divorce seemed along party lines, (Rainbow, All Ethiopian Unity party) but the implication is far beyond that even sometimes reflecting ethnic basis. I usually have got a chance to visit some Pal Talk room and I learned a lot about the personalities of this two group leaders. Dr. Birhanu Nega is, according to some of the rooms, very ambitious to power, lenient and wants to compromise with the government; even he is accused as working to the current government. On the other hand, Hailu Shawle is a dictator, hard line leader, ambitious to power and the like. Any way, there is no a litmus test to identify who is the better leader. For me both are not a good choices to lead the staggering opposition. Ethiopia needs very strong opposition leaders not leaders who failed to lead a party. I just want to mention that there are some promising leaders in the party, too. I was a student in the 1990s and in the same batch with Bertukan in Addis Ababa University. I observed openness, honesty and engaged in dialogue then and now when they tour America. Hence, she can be a good leader if she works hard to accumulate experience, and smart enough to pass this crises.